In the wake of the release of Trump’s long-awaited financial report, the Office of Government Ethics has effectively reported Trump to the Department of Justice for possible criminal charges. Trump’s financial disclosure, released on Wednesday, revealed for the first time that he paid more than $100,000 to his personal attorney, Michael D. Cohen, as reimbursement for payment to a third-party. The disclosure, released by the Office of Government Ethics, did not specify the purpose of the payment. However, Mr. Cohen has paid $130,000 to an adult film actress, Stephanie Clifford, who has claimed she had an affair with Mr. Trump. Mr. Cohen has said he made the payment to keep the actress, who goes by the stage name Stormy Daniels, from going public before the 2016 election with her story about an affair with Mr. Trump. A footnote in the disclosure said that Mr. Cohen had requested reimbursement of the expenses incurred in 2016 and Mr. Trump had repaid it in full in 2017. It did not give an exact amount of the payment but said it was between $100,001 and $250,000. The federal Office of Government Ethics, in a letter to the Justice Department released Wednesday, said that “the payment by Mr. Cohen” to a third-party by law should have been revealed in Trump’s financial disclosure filing last year. “In the interest of transparency, while not required to be disclosed as ‘reportable liabilities’ on Part 8, in 2016 expenses were incurred by one of Donald J. Trump’s attorneys, Michael Cohen. Mr. Cohen sought reimbursement of those expenses and Mr. Trump fully reimbursed Mr. Cohen in 2017. The category of the value would be $100,001 – $250,000 and the interest rate would be zero,” a footnote in the president’s financial disclosure form reads. A note in the document says “OGE has concluded that the information related to the payment made by Mr. Cohen is required to be reported and that the information provided meets the disclosure requirement for a reportable liability.” This means that the ethics office deemed that the payment to Cohen, made in 2016, should have been reported last year. “This is tantamount to a criminal referral. 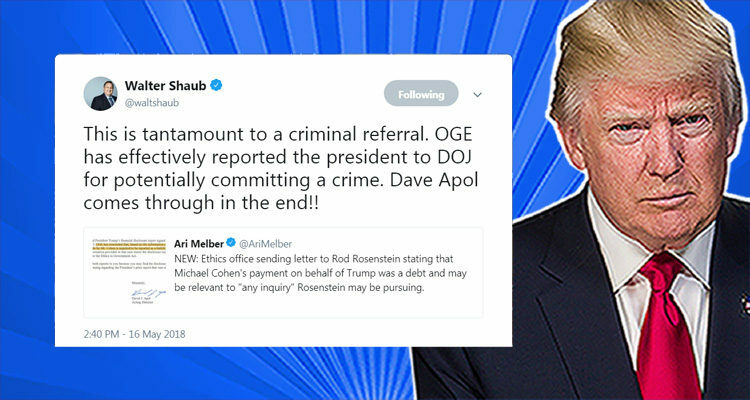 OGE has effectively reported the president to DOJ for potentially committing a crime. Dave Apol comes through in the end! !” he tweeted.